This talk was delivered by Humphrey McQueen on 3CR Solidarity Breakfast as part of the celebration of Marx’s 200th birthday. As part of our celebrations, this morning we’ll look into another of the works he wrote with his lifelong comrade, Engels. We began with their German Ideology from 1845-6, and now we’ll enjoy The Communist Manifesto from 1848. Now for The Manifesto, which was written in the heat of a revolutionary upsurge. The Chartists had rocked the United Kingdom throughout the 1840s. The years 1848 to 1851 see uprisings across Europe, from Ireland to Poland. Engels is on the battlefront in south-west Germany. Richard Wagner is heaving a piano onto the barricades in Dresden. 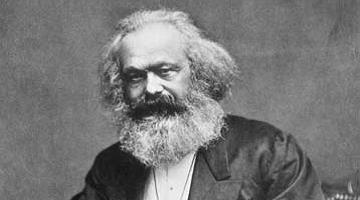 Marx is a political exile because of his writings. In July 1847, he organises the Communist League which commissions The Manifesto. It is published in February 1848. Parts I and II are a prose poem – perhaps the world’s first prose poem. (1) The energy of Marx’s style captures the power of his subject matter. In preparing these notes, I found myself reciting The Manifesto aloud. It lends itself to declamation. Indeed, Berthold Brecht shaped The Manifesto for a cantata with music by his fellow Communist, Hanns Eisler. A dialectical approach reveals that capitalism makes possible its opposite in communism. One trap in approaching The Manifesto is that its pace sweeps us along so that we can miss much of what Marx and Engels are saying. We need to apply the brakes. To show why, I’ll unpick the opening paragraph. Who doesn’t know the first sentence? Engels’s correction doesn’t go far enough. What he calls ‘written history’ came after the emergence of classes. Evidence about that earlier epoch is from archeology, not written records. Objects tell us next-to-nothing about what their makers thought or how their societies were organised. What divided them? The pairings are of economic categories, which is what we might expect. But Marx and Engels sum them up in terms of oppression, which indicates a broader set of power relationships. Although they do not say so, we can sense the long arm of the state as the means to enforce oppressive economic relations. The crux of being an historical materialist is to reject all explanations that impose an ‘eternal, natural and universal’ order on human activity. Our task is to answer the question ‘how exactly?’ for each time and in every place. There’s one more point to take from ‘uninterrupted, now hidden, now open fight’. The class struggle is not a pantomime dragon which stirs for the final act but otherwise sleeps through the drama. Too often, people equate ‘the class struggle’ with big events – 1848 or 1917. Those revolutionary upsurges are, of course, expressions of class conflict. Under capitalism, however, the struggle goes on every second of every day – and throughout the night. Working longer, working harder, working broken shifts, being out of work – all impact on the quality of our sleep, and of our dreams. the common ruin of the contending classes. Progress is not inevitable. Marx and Engels never fell for what is called ‘the Whig interpretation of history’ in which things get better and better. They knew too much about the Ancient World to suppose that life always improves - more or less– and sooner or later. The glorious socialist future is no sure bet. Like every other advance, its likelihood depends on how each side wages the class struggle. It’s also worth pausing to consider the phrase ‘revolutionary reconstitution’. Too often, Marxists think in terms of ‘a transition from feudalism to capitalism’. Transition is a long way from any kind of revolution. The Manifesto sweeps across thousands of years to spell out ten current demands. They ‘will be different in different countries.’ Once more, there can be no eternal, natural or universal. We don’t have the time to examine each point in detail. Yet it’s worth noting that four of the ten relate to agriculture, which might be a bit of a surprise. Marx always included agriculture under his treatment of industrial. He didn’t restrict ‘industrial’ to steam-driven factories. Abolition of children’s factory labor in its present form. Combination of education with industrial production, etc. etc. How does that differ from the current bleats out of employers and so-called education ministers for schools to turn out students who are ‘job-ready’? The demand in The Manifesto is one more expression of historical materialism. Recall our discussion of The German Ideology and ‘Thesis Eleven’ about interpreting the world and changing it. They are parts of a whole. They are not choices. Here, Marx and Engels apply that insight to formal education. We learn by doing. That Marx and Engels did not know how exactly that precept should be put into practice is clear from their lapse into ‘etc. etc’. How do we put The Manifesto into effect in 2018? Above all, we must follow its lead with demands related to everyday life. We can think in terms of ‘Five Pillars” of immediate and ceaseless concern for working people: housing, transport, work, health and education. The sixth element is to link the environment inside each of those. Our bio-system is not a thousand miles away from our daily doings, not a wilderness, but backyards, front streets and worksites. The seventh pillar is to defend the freedoms that our class has won the capitalists so that we can keep advancing all our needs. Slow reading alone is not enough to savour all the ingredients that Marx and Engels stir into the rich pudding of The Manifesto. Their text is a short course on Western thought since the Greeks. rescued a considerable part of the population from the idiocy of rural life. The phrase ‘rural idiocy’ is not a swipe at people who live in the countryside for being naturally stupid. The phrase combines Aristotle and Rousseau. ‘Idiocy’ is not an IQ score. Aristotle is the source for the term ‘idiocy’ in contrast to his view of humans as ‘political animal’. The Greek notion is that only the active citizen could be fully human. This view links to The Manifesto’s call to even up urban and rural life. Four years later, Marx recognises that the French peasants are a class-in-themselves but not yet a class-for-themselves. He pictures them like potatoes in a sack, lumped together but with no interaction. That weakness allowed them to be manipulated by Napoleon III. Their ‘idiocy of rural life’ is also a whack against Rousseau for whom the ‘state of nature’ is good, happy and free while society corrupts us. No. As Marx puts it in Capital: even if we are not Aristotle’s political animal, we are ‘at all events a social animal’. Helen Macfarlane did the first English translation in 1850. Engels supervised an English edition in 1888, with adjustments and corrections. As we have seen, a few of those changes are highly significant. All the editions on offer today include these improvements. If all you want are the thirty pages of the text, it won’t make any difference which version you pick. Go for the cheapest – download from Marx Archive. To locate The Manifesto in its historical context, however, two other considerations come into play. First, how insightful is its introduction? Secondly, how much supporting material is included? On both those criteria, I rely on the 1971 edition from International Publishers in New York. The editor was the remarkable Dirk J Struik. Struik was a Dutch-born Marxist, a mathematician and an historian of mathematics and of technology. He provides a seventy-page Introduction and ninety pages of related writings by Marx and Engels. By all means read The Manifesto at full belt for its excitements. But then go back and ponder it sentence by sentence – even phrase by phrase. We’re richly rewarded every time we do. (2) By January 1848, Marx still had not distinguished 'labour' from 'labour-power'. That breakthrough came years later as he slaved his way towards finishing Das Kapital in1867. Marx was not born the author of Capital. He got there through study and struggle - interpreting and changing the world.